The findings that were published in the Proceedings of the National Academy of Sciences are a rare example of a bacteria-to-animal gene transfer that has had an obvious benefit. Jocelyn Rose, a plant biologist at Cornell University, in Ithaca, New York, and his colleagues think that the transferred genes, which let the beetle break down complex sugars that are found in the coffee bean, came from the beetle’s intestinal flora. This kind of nonsexual horizontal gene transfer (HGT) has been widely documented in prokaryotes, but there are relatively few examples of this in more complex organisms, including higher animals. 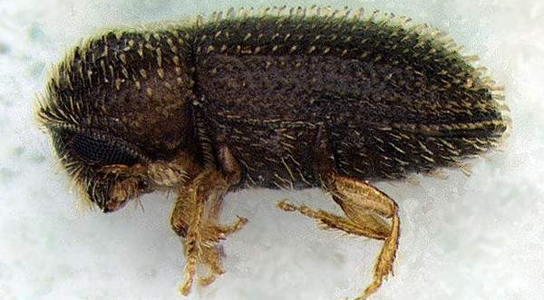 Hypothenemus hampei is a small beetle native to Africa that has spread worldwide during the 20th century. Rose and his colleagues examined its genome. 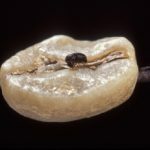 They identified a beetle gene, HhMAN1, that codes for a protein called mannanase, which breaks down polysaccharide galactomannan that is found in coffee beans. The gene closely resembles the sequence of bacterial mannanase and it’s the first kind of this type that has been discovered in an insect. The gene lies between two transposable elements, indicating that these transposons may have enabled mannanase to jump from bacteria to the beetle genome, although the exact process is completely unknown. It’s possible that the adjacent transposons are coincidental. Be the first to comment on "Rare Example of Bacterial Gene Transfer Providing Evolutionary Benefit"